Miso Crafty Knits: Knit, Knit, Knit! I haven't been prolific with the baby knits as I was hoping to be during the month of July, but for a while there I was so sick that I didn't even want to knit. Yeah, you read that right. I didn't want to knit. You know you're really sick when... The sad part was that for the first two weeks I didn't even know I was sick. I had just assumed the unwell feelings were due to stress, late nights, too much caffeine, and possibly the onset of the loathsome summer flu. And when I did have the energy to knit I was completely all over the place and would spend a few minutes here and there knitting on one project before moving on to knit for a few minutes on another. In some ways this scatterbrained style of knitting has gained me a fair amount of progress on a few projects but obviously if I concentrated on one knit at a time I would get projects done a whole lot faster. But please, who does that? Apparently not me! Anyhoo...craziness aside, I have managed to whip up five baby knits (six, if you count the Milo vest I had knit last fall that was put in the "to-gift" box), all on top of the socks (yes, I can knit on socks again!! ), a shawl, and a gift stole that I've been working on. The baby knits are all so darling that they make my ovaries hurt. I had originally wanted to knit a dozen baby items but I'm thinking of bumping up that number because I would love to knit a few of my favourite baby patterns for my cousin's winter bundle of joy and some "follow-up" kiddie knits for a few of my closest friends' little girls. At the start of the weekend I had cast on a dress (Sproutlette by Tanis Lavallee of Tanis Fiber Arts, in case you were wondering) using a pretty girly colourway (it's the yarn in the photos in this post) after learning that one of my friends had revealed the gender of her baby. My previous baby knits were all reasonably gender neutral so I was excited to do a gender-specific knit. I absolutely loved working on this dress so much that I was surprisingly able to concentrate on it solely for the entire weekend. I've been pleased as punch that I've been able to finally knit up some of the single skeins of yarn that have been floating around my stash that were not designated to a specific project. Yay for one skein baby knits!! 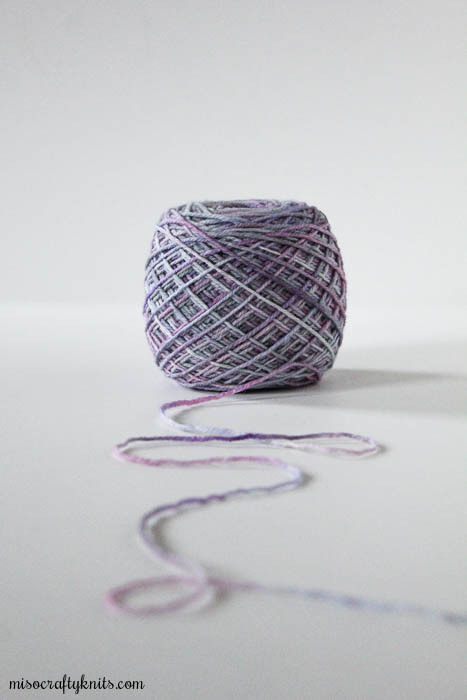 Even more importantly, baby knits that use different yarn weights!! I have random solo skeins of worsted and DK weight in the stash that I have no idea what I bought them for, and one of the finished knits I even managed to use up a leftover skein from one of my sweater projects. YESSS!! Even though I already have the next handful of baby knits sorted out, I think I might take a few days off from knitting to give my hands and wrists a rest. This might even be the perfect time to give the pile of FOs on my desk some attention. 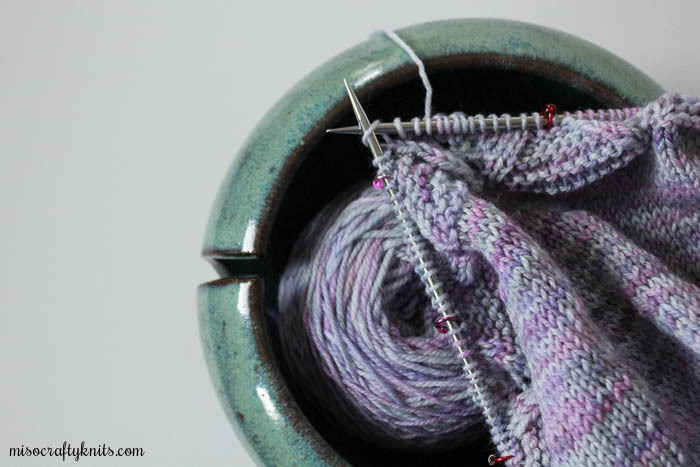 I've blogged about so many knits in progress with only three FO posts this year. So sad. Meanwhile there's a stack of unfinished finished projects that I would eventually like to wear this fall. Unfinished finished projects? You know what I mean, it's those projects that you've finished the knitting on but still need to weave in ends, block, maybe add a few buttons. I don't know about you but for the most part I don't consider a project "finished" until it is completely ready to wear. Sometimes, not even then. Sometimes it has to be photographed and blogged before I can consider it done like dinner. Hmmm...but doing the final finishing touches means I'll have to weave in ends and sew on buttons, all of which will take away from the knitting. I'm going to knit on my shawl for a bit and think about this. So sorry to hear you were so unwell! That is definitely really sick, when you can't even be bothered to knit, ugh. Poor you! But now that you are on the mend, it's great to see your new project- I love the magic of baby knits for using up single skeins, too!